Showers of Blessings: Shared WIP Tag: Week Four! 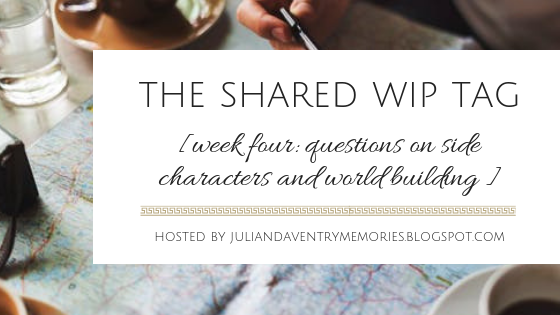 Welcome to week four in the Shared WIP Tag that I am participating in for the month of November! Nano is coming along, no matter how slow or fast, I am making progress! And any progress is good progress! This Friday, I will be sharing with y'all about my SC's, (side characters) or at least some of them! I obviously can't list all of them! Let's start with the introduction! 1. List your SC's, state one of their main hobbies, and tell us how they influence your MC in the story. So, I am going to be talking about five side characters. Instead of answering how they influence my MC, I am going to answer who they are to the MC... I also threw in age too! 2. Who is the SC that is the closest to your MC? Dakota is very close to all of her sisters and cousins! Bea sticks to Adam like glue! 3. How do your SC's act around people they don't know? Mabel is quiet, but not shy around people she doesn't know. Addy is very shy and quickly goes back into her shell. Emma is bubbly, talkative, and alway's looking for a new friend. At heart, Lexi is a social butterfly, but she takes some time to warm up to new people. Bea is leery of strangers, but she is not afraid. She is a little spitfire. 4. How do they add conflict to the story (disagreeing with the MC, perhaps)? These side characters will quarrel occasionally. But in the end, they all stick together through thick and thin! 5. Would your MC die for any of them? What about vice versa? Without a doubt, yes and yes! Dakota and Adam would do anything for each of their family members. Same, vice versa! 6. If you were writing a book about your SC's,what might the books be like? 7. What is your favorite part about the setting? I love this time in history! I think that the Oregon Trail is a perfect setting that already adds a element of excitement, creating a writer's ideal location for adventure and heartache! Anything is possible for the characters to encounter and overcome! 8. What was the hardest part about coming up with the setting? All of the research put into making the history as accurate as possible. It's one of my biggest reader pet peeves when historical-fiction doesn't add up right with the actual time frame in history. 9. Is there anything about the setting that produced a major change in your character throughout the story? I'm not sure if I understand this question fully, but a major change that you would see in my characters is the way of their dress, food, talk, etc. would all be from the 19th century. Like for instance, if my character had a birthday or special occasion, instead of eating birthday cake, they would have Molasses Stack Cakes. And obviously as the traveled west, they would learn things about "surviving" in the untamed land that they probably wouldn't have learned in the city. 10. Did you base your setting off of any place in particular? That just about sums up week four! Thank you for reading about some of my side characters! And be sure to stay around for next weeks WIP post! Can you relate to any of these side characters? Do you like reading about the Oregon Trail and/or the Wild West? What was your favorite part of this post? What do you think of the Black Friday sale going on?? Ooo, your story keeps sounding cooler and cooler! Can’t wait to see The Aesthetics! Sounds like a fun bunch! IM SO EXCITED FOR YOUR STORY AAAHHHH. ME TOO! THANK YOU, VICTORIA! I've never tried writing historical fiction because I'm not sure I'd be able to make it historically accurate, so it's great to hear you're putting in the effort there, Brooklyne! Oooh, I like the sound of Addy! I relate to Emma, and I'm learning about the Oregon trail in school. I used to hate history until I read this book and now I love history I can't wait to read your book. 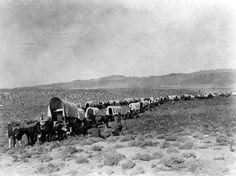 Did you know that the settler's put their wagons in the circle and some slept in the wagons, under the wagons, or in the middle of the wagons. To keep them safe. Did you get any snow this week? We had a lot and yesterday we had a snow day cuz we had so much. Your side characters all sound so fun! These posts are very cool, I love being able to read more about your characters and story!